When you go western saddle shopping, you will be given literally hundreds of options to choose from. Saddles can cost between a couple hundred bucks to thousands upon thousands of dollars. But price is not a guarantee of the quality of a saddle, especially if you are shopping for used saddles. A solid understanding of the qualities that make up a sturdy saddle will help you tell the higher-quality items from the low-end saddles. Examine the saddle closely for a manufacturer's mark or brand name; the brand name should be stamped into the leather or on a small metal plate that has been fastened onto the saddle. Locate the serial number, if possible. The serial number will be located under the skirts or in the same location as the brand name. Research the saddle using the manufacturer's name and the serial number to determine retail and general resale value; cheap, poor quality saddles will have low prices brand new and very little value as used items while good quality saddles sell for higher prices both new and used. Turn the saddle over and inspect the fleece on the bottom to see if it is missing or thin. Cheap, poor-quality fleece that appears thin when the saddle is new will quickly wear down or completely rub off the saddle as it is used, while good-quality saddles feature thick fleece that takes a long time to wear. Inspect the saddle closely to see how it has physically been put together; good saddles are constructed using thick, sturdy, even stitches that stay tight and in place for many years without issue. 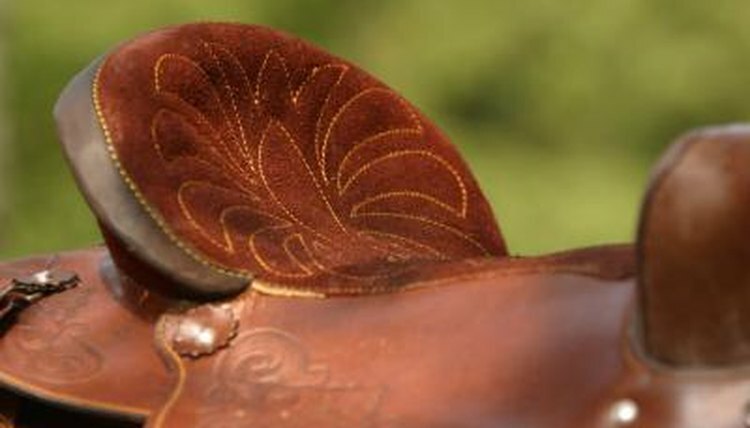 Look for loose threads, uneven or torn stitches or areas on the saddle where the stitching is missing entirely to identify a cheap, poor-quality saddle. Avoid any saddle that has been glued together rather than sewn, as it is definitely a cheap, low-quality saddle. Check the quality of leather that the saddle is made from. Look for good-quality leather that is thick and pliable when you touch it and bend it. Avoid saddles that have thin, flimsy leather or have texture similar to cardboard or paper, which is common with cheap saddles. Check for obvious flaws by thoroughly inspecting every inch of the saddle; good-quality saddles appear sturdy and well-made when visually inspected for flaws, while poor-quality saddles have flaws even when brand-new. Make sure the saddle does not have any rips, bumps, lumps, tears or other visible flaws that occur fairly regularly in poor-quality saddles that have been constructed using cheap materials.  Always research your saddle purchases thoroughly before you buy. Research tells you exactly what type of saddle it is and its approximate retail value, especially when dealing with older or used items. Check the online product reviews for that specific saddle manufacturer and model.  The cheapest, poorest-quality saddles typically do not have any kind of brand name. Staying away from no-name saddles will help you avoid accidentally purchasing a low-quality saddle.